This is the sight that greeted me on the morning of March 4, 2014, a day that shook my faith in my skills as a meteorological forecaster. Next year, when friends and passersby ask me at the end of February or beginning of March if I think it's safe to plant/prune/whatever, I have an answer ready: "remember what happened this time last year?" I am thankful to report that despite being laid low by the combination of rain and an extended period of sub-freezing temperatures, the garden has rebounded somewhat as of this Garden Bloggers' Bloom Day*. True, the toadflax are still flopping, much to the displeasure of the Head Gardener, who would prefer we be much more ruthless in our thinning of seedlings. Many of the roses were set back by the unforeseen cold snap: tender new growth and younger buds were damaged. The blooms on the 'Anna' and 'Dorsett' apple espalier were at a critical point. Tiny apples were just forming and those are now dropping off the branches. New blooms have taken their place, though. And the formerly bedraggled bluebonnets are bursting into bloom! *Garden Bloggers' Bloom Day is hosted on the 15th of each month by Carol of May Dreams Gardens. Thanks, Indy! You have been have odd weather almost as much as we have - but you still have blooms, while we are still waiting for the snow to melt. We tend to forget what happened in previous years when the sun shines brightly. I hope it's almost over, cold weather. I am glad the garden is recovering. Gardening is not for the faint of heart! It's been a tough winter for everyone this year. 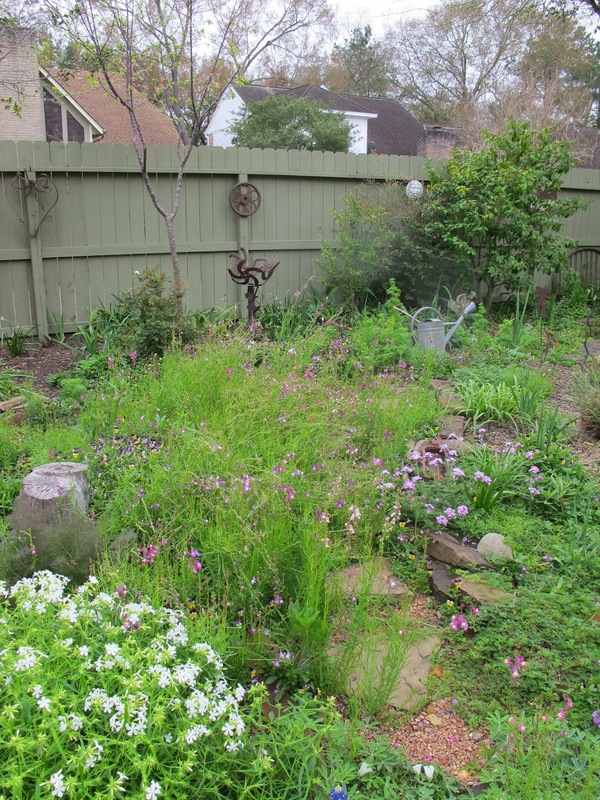 Glad to see so much green in your garden, though, Cindy; mine is still mostly brown. Those bluebonnets are certainly a cheery sight! My fruit trees got zapped as well. The apples got the worst of it, because they were the furthest along. I'm glad to hear yours are re-blooming. No two years are alike. It looks marvelous to my snow blinded eyes. Lots of lovely blooms! Thanks for joining in. I couldn't tell what was wrong with the first photo until I saw the second photo. I was admiring all the blooms in the first photo, because, like Commonweeder, I have melting snow and soggy lawn to look at, currently. 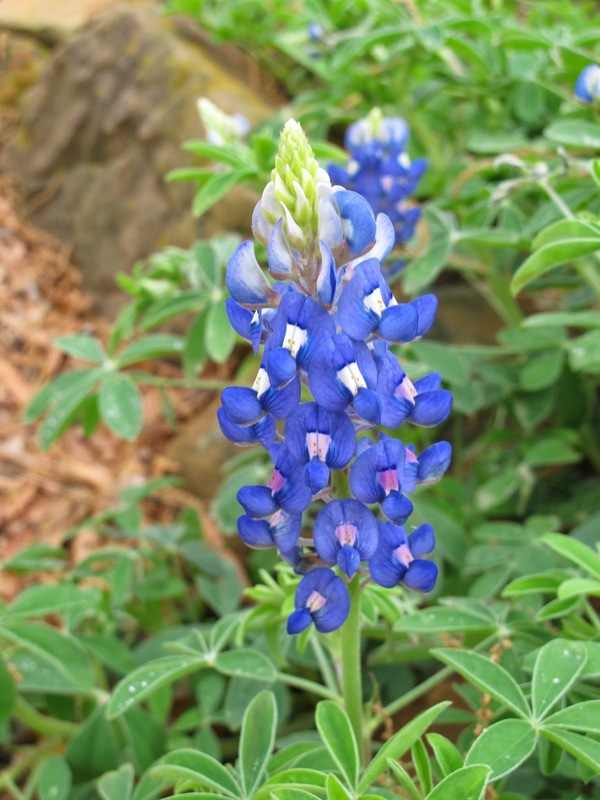 Blue bonnets will always brighten a garden! 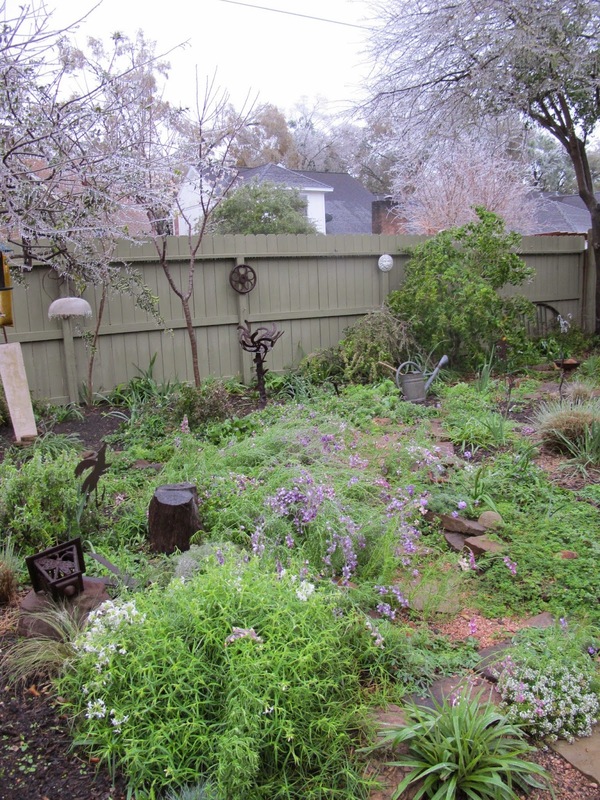 Your yard, in spite of all the cold, looks wonderful! Blue bonnets always brighten a garden. I have a feeling its going to be a banner year for them!